Ninja! Ninja! Ninja! published on May 31, 2013 Read more posts by the author of Ninja! Ninja! Ninja!, agent_xNo Comments on Ninja! Ninja! Ninja! Hello there gentle readers. I need your help,so that I can see some NINJAS! Yep, you read that correctly. Ninjas. Shinobi. Shadow warriors. Master Assassins. Sneaky guys. I really love ninjas (don’t we all?) and in a few weeks, I will be travelling to Japan with my Karate club. 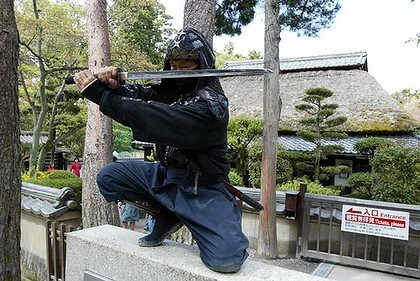 Whilst I am there, I really really really really want to go to Ninja World. When I get there, I will be able to experience the ninja world, maybe practice taijutsu (unarmed body combat skills) and finally learn how to jump up onto he roof of a 3 story building and then disappear into a cloud of smoke. That last thing could become very handy in real life. To raise the cash I need to get there, I am willing to trade you my superb Ninja drawing skills for just a tiny bit of cash. You tell me what kind of ninja you want me to draw and I will create some unique Ninja artwork just for you. Yes, you! The way to pick your ninja, is to tell me what you want to see “ninjarised” (yes, that is a word…….probably). I will create a one-of-a-kind picture of your ninja. These pieces are totally 100% hand crafted, using Ink and Water colours. The final artwork is on A5 sized 115gsm acid free paper. You can choose if you want your artwork framed or not. Each piece is only $20.00 un-framed and I can add a frame for just $5.00 more. Shipping is free if you are in Australia. International orders have a flat fee of $15.00 shipping. There are a few samples below, so you can see what the pieces can look like. GET YOUR VERY OWN NINJA TODAY! This is a very limited offer, as I am going to Japan very soon. I will only be creating a limited number of Ninja artworks. So place your order below and I will get your Ninja artwork created and sent to you asap. What Ninja do you want?